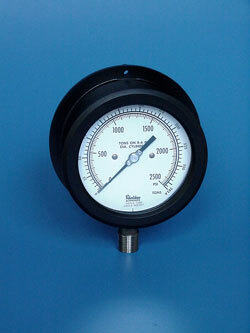 Hydraulic Gauge Series 1800, Gauges and Diaphragms, Houston, Texas | Texas Valves & Instruments, LLC. Hydraulic Gauges are designed especially for use on hydraulic equipment where sudden releases of pressure are experienced. A throttling screw in socket, delrin movement and spring link are standard. Case Size: Phenolic, 4.5"; Aluminum 4.5" or 6"
Note: When specifying this gauge, it is essential that all information be given regarding the diameter of the ram and amount of force on the ram (usually given in tons). Accuracy: ANSI B40. 1 Grade 2A ±0.5% of span. Designate 20-2000 Series in Table I. Designate C in Table VIII when ordering.